Could Bungie's New IP Be an Action RPG? Bungie's next game universe might be quite a bit different from Halo, if job listings mentioning a "branching or non-linear narrative" are any indication. 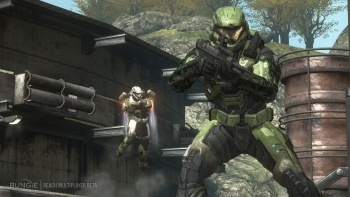 Bungie is best known for its Halo series of FPS games that were practically a household name in the past decade, and probably second-best known for its Marathon series of FPS games (a very distant second, but a second nonetheless). With Halo and Marathon under its belt, you'd think that its new "game universe" being developed under partnership with Activision would be a FPS, right? As noted by Gamespot UK, some listings on the Bungie jobs page point to the next game universe being significantly more story-rich than Halo. Specifically, the posting for a new Writing Lead mentions that it would be "a plus" for someone to have experience with writing "branching or non-linear narrative(s)," which leads some to conclude that Bungie's next game might have RPG elements like Deus Ex. Another potential clue is the posting for a "Player Investment Designer" whose job it will be to build "worlds imbued with real value and consequence," and to give players "long-term goals to invest them in the world and their character." Also sounding pretty damn RPG-ish to me. In fact, if not for the "branching narrative" bit, I might almost be inclined to say that it sounded fairly MMOG-eque to me. Whatever the case, it's safe to say that you may be significantly more attached to your character in this new Bungie universe than you ever were to the Master Chief.